This entry was posted in Fiction, History, Military, Novel, Religion, Society and tagged 2000 pigs, devils, Gadara, Gadarene swine, Gospel, Israel, Jesus, Jews, Judaism, Legio X Fretensis, Legion, madman, Paul, pigs, Romans, uprising, Zealots. Interesting. I didn’t know about X Fretensis and their boar symbol. Yeah. Marching around under a graven image of a pig was never a successful part of the “hearts and minds” campaign in Israel. I did remember either thinking about, or reading about, the issue of all those pigs and the fact that their loss would be rather devastating to the local economy. 2000 pigs might not sound like a lot today (actually, it kinda does) but back then that would likely have been most of the wealth for either one person, a family, or even an entire town. And that’s if the story is real. As you have said, the local Legion’s symbol was a boar. Another way to look at it was that the story is telling what Jesus was saying he was going to do, rather than something he did. A Legion had something like Five Thousand troops. A large garrison could have something like 2000. This could be taken as him promising to send the 2000 Legion “Swine” (which would fit, since I think Legions sometimes called themselves Legion X Totem, such like Legion Boar, or Legion X Boar) into the sea. Which would explain just as well the local Town not wanting him to come as if he had physically sent 2000 pigs into the sea and devastated their economy. 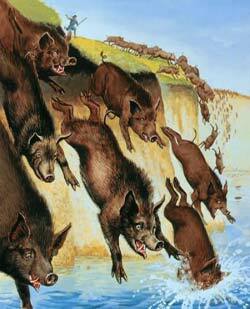 My guess is that the Jews of the time referred to the Romans as “pigs”. Wiping out the Legion’s herd of 2,000 pigs would be very newsworthy, the story would be good for Jesus’ reputation. The number also resonates with the 2,000 Jews who were crucified at Sepphoris (Zippori), 4 miles from Nazareth, in the suppression of Judas of Galilee’s revolt when Jesus was 12. In that sense, an act of symbolic revenge. Probably right. Hel, for all we know, we’re both right, and he wiped out the pigs to show his power and ability to wipe out the Romans. Jesus was not documented much at being at odds with Rome as he was his own people — particularly the religious elite — who kept the people far from God with their own ideas and rules. I obeyed Roman law as far as we can see, and paid his taxes, etc. Rome could find not one basis for a charge against him — I would think the provincial Governor would have been privy to this since it happened within recent memory of his trial. All we know for sure if they were outside of Israel and these people were Gentiles. In fact, the area of the ten cities (Decapolis) seems to suggest a certain Greek mixture too I would think. The specific statement you made about Jesus wiping out the Romans was not his agenda, which actually became a turning point for many followers and people who were interested in this itinerant miracle worker, because they started to realize that his overthrow would be silent, and start in the hearts of men, on his terms — not to remove the occupying power as they had hoped., He never once suggested anything of the sort and would free men from sin — not Israel from Rome. You are quite correct that this is the view expressed in the Gospels. The point of my book, and of this blog, is that if you review the words and actions of Jesus in the context of his life in the middle of 200 years of Jewish uprisings against the Roman occupation, you will become aware of a different possibility: that Jesus was a Jewish fundamentalist who was crucified for leading an unsuccessful uprising in the Temple at Passover. While the biblical documentation does show that Jesus might not have been very anti-roman himself, he did become a central figure to a lot of Jews who were very anti-Roman. His gathering crowds and speaking out against Paganism disrupted the peace of Rome as much as it did the power of the Jewish religious elite, who’s anger certainly did threaten the Roman Peace. Add into this fact that one of his closest disciples was Judas Iscariot, or Judas the Zealot who was known as an anti-Roman prevaricator, and suddenly the Roman government has pretty much all it needs to consider Jesus a threat the Roman Empire, not to mention in the eyes of the Jewish people, who the bible states did believe that Jesus was coming to kick out the Romans. I think you are absolutely right about the 10th Fretensis being the source for the 2k swine but I think you have missed the point of the original story. The bare bones of the story are that a madman, wrapped in chains is forced to live in a cemetery, a big no-no for Jews of the time. What this actually refers to is that Jews were forced to live in the new city of Tiberias that had been built over an old cemetery in the early 20s CE. The 10th Fretensis was used to guarantee that the Jews stayed there. There is no place near Gadara that geographically suits the story but there is next to Tiberias, the slope of Mt. Arbel. Jesus was declaring what would happen to the 10th if they did not leave. Jesus, as a devout fundamentalist, took great exception to this and used the story to preach against what Herod Antipas, who had the city built, was forcing the people to do. He began his ministry with this action around 24CE, after the city had been built (building began around 19 CE) and when he was ‘about 30’ years old, if he was born in 6 BCE, as many scholars think. The reason people in the region didn’t want Jesus around was because he was inciting a rebellion and they knew what that would mean for them once the Romans stepped in to quell the rebellion. I’ve always wondered, if Jesus was such a peaceful guy, spreading love and tolerance, why so many people were afraid of him, haven’t you? Guys stop making fun of Jesus. This kind of attribute to Jesus is not acceptable.Jesus was a truth and one of the greatest prophet of God.blame those guys who wrote the bible. Jesus never ever made this kind of silly mistake. Was there an owner of the 2000 drowned pigs? I think the answer could be no.That would be the case if it was a herd of wild boars. I know of herds of wild boars as large as 100, in Russian forested areas. But a) a herd of 2,000 would be unsustainable without human care, and b) the Golan Heights where this took place would definitely not sustain more than a couple of dozen. As for ownership, the name “Legion” is not in this story by accident. Jews did not eat or own pigs. But the Roman army of occupation certainly did. The pigs could have been there for numerous reasons; just because you can’t comprehend why a certain animal is in a place, doesn’t justify your opinion. Some say they were there as a sacrifice to the idol Zeus; or it could be that they were just wild. Because in the book of Romans, I think the Greeks were mentioned. It’s called reading the entire Bible, not quoting just particular parts. I recommend reading some history of the Roman Empire, specifically of Palestine and Syria. It’s called getting an education, not quoting just one unreliable text. The Bible MUST be treated as a source of education and fun. All religion is funny, but you can learn a lot from it at the same time!